SpaceX’s successful docking into the International Space Station may have ushered in a new era of spaceflight, but the success of the trip also bumped the company’s valuation into a higher orbit. SpaceX made history last week when it became the first privately held company to dock a spacecraft on the International Space Station. According to financial data company Privco, that milestone was enough to push SpaceX’s worth to $4.8 billion, up from the $2.4 billion valuation before the mission. PrivCo bases its numbers on SpaceX’s past and future — its recent successes, and rather busy launch schedule over the next few years. SpaceX has fifty-five launches planned through 2017, most of which are for commercial satellites. 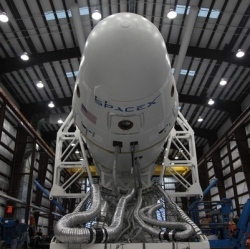 SpaceX is also contracted with NASA for a dozen resupply missions to the ISS. But it wants more. According to SpaceX spokeswoman Kirstin Brost Grantham, the company’s next big step would be landing a contract with NASA to bring astronauts to and from the space station, which it hopes to do by 2015. Total values for these contracts already top $4 billion, so clearly, SpaceX is going to be busy (and making money) for some time to come. But what about its IPO ambitions? Grantham says those aren’t on the horizon right now: SpaceX is almost entirely committed currently to working out a regular rhythm for its launches — which means don’t expect the company to go public any time soon. Speaking of IPOs, in a clear jab at Facebook, PrivCo said that SpaceX’s valuation in relation to post-IPO Facebook is reason enough for investors to look beyond Silicon Valley for investments. Another important nugget from PrivCo is that, with the latest launch, SpaceX CEO Elon Musk may have finally become a billionaire. PrivCo estimates that Musk owns 65 percent of the company, making his on-paper stake in the company total roughly $1.6 billion dollars.